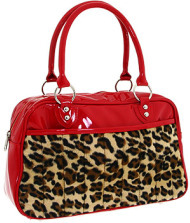 Get lost in the neon lights with the stylish Leopard print tote handbag by Lux De Ville. Soft and fuzzy animal print exterior with super modern red shiny vinyl trim. Holds your wallet, sunglasses, personal technology and a small bottle of water. Dual handles. Handle drop: 7 length. Platform bottom with feet to protect bag when set down. Available with black trim too. With all of Lux De Ville’s designs, there is a sense of individuality, art, and vintage appeal. Lux De Ville adds tattoo inspired designs to their styles, keeping you looking young and chic.